The Le Mans race which is a 24 hours race is the world's oldest and active car racing event. The focus is just not on speed but also the car's ability to sustain continuity when it is running non-stop. 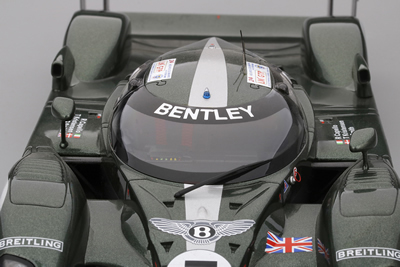 The Bentley Speed 8 was an Autosport Award Winning Le Mans Prototype race car that was designed by Peter Elleray. It debuted in 2001 and shared many things with the Audi RC8. This car also marked Bentley's return to racing after a 73-year absence. In 2012 a Bentley Speed 8 was sold in an auction for nearly Rs.16 crores. This scale model in RESIN is 1 of only 750 pieces made. Being a RESIN model expect highest degree of detailing. Highly discounted.